Come to Putney on August 14th to see over 140 riders from 22 nations and most of the teams from the Tour de France race through. It’s the full dress-rehearsal for the 2012 Olympic cycle race. 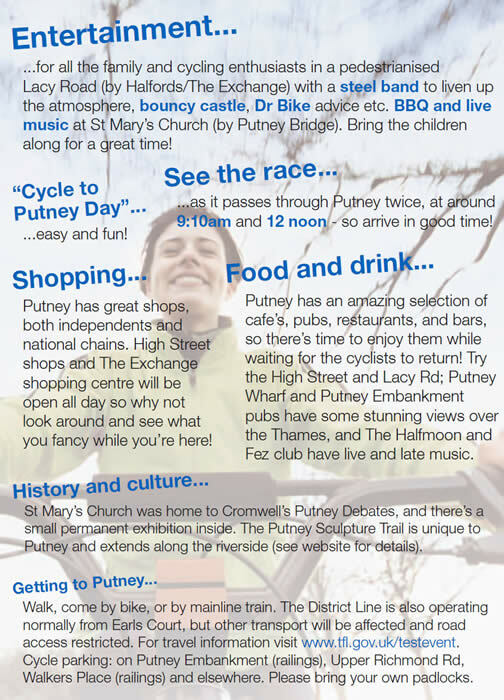 Visitors are being encouraged to join the 'Cycle to Putney Day' to make it easy to get here! The race starts at 9am in The Mall, comes through Putney around 9.10am, out into Surrey, then back through Putney around 12 noon.